I’ve been at it again! For those who remember my Akashi review, I seem to have picked up a habit of reviewing Japanese whiskies at a particular bar that I occasionally habituate. Not a bad vice I must admit. This visit’s subject is Nikka from the Barrel, which comes in an intriguingly plain, stubby little 500ml bottle. The labelling is sparse to say the least, and not particularly useful if, like me, you cannot read Japanese. It’s not only the bottle that has limited information. The little that I could find out about this drop is that it is a blend (or as Nikka claims, a marriage) of matured malt and grain whiskies from re-casked barrels. Bottled at 51.4%, the Nikka has a robust, gutsy nose. Dark honey, peach, apricot and orange jump on to the old scent receptors, although m’colleague swears blind that he could smell corned beef (odd man). On the palate the Nikka is rich and syrupy, with notes of burnt sugar, oak, sultanas and honey, followed up by a pleasant herbal bitterness that reminds me of Speyside. I would take an educated guess that sherry barrels have played a part in the blend, as something of that quality seems to shine through. 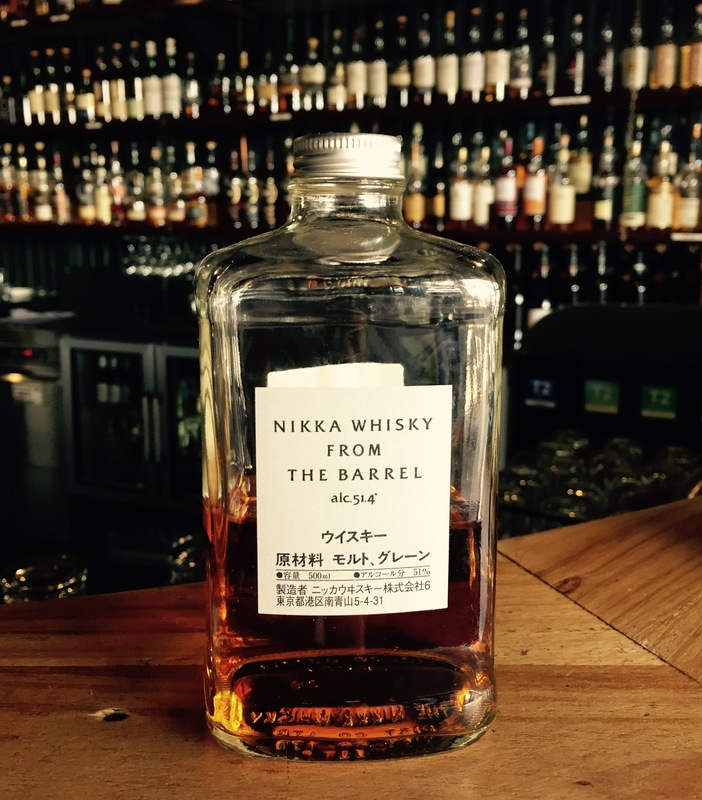 The Nikka from the Barrel is a fantastic Japanese blend. It’s bold, gutsy, fun and will put a grin on your dial. Definitely give it some attention if you come across a bottle. I remember trying this beauty in 2013 and being astounded at how good it was. A truly memorable whisky and further proof that Japan is doing some phenomenal stuff with their whiskies! Looking forward to more posts mate! Cheers Brendan. Yeah, thanks to the limited info I was going into it blind, and boy was I not disappointed. That little guy certainly punches above its weight. Defs mate! Really good value for money and something worth keeping around for special occasions heh. One of my favourite Japanese whiskies and also one of the few that one can get here where I live. I feel that it is also one of the best value for money Japanese whiskies there is (and it is cask strength!). I quite like the origami styled box it comes in. Yeah, it’s certainly a good’un. There’s a lone bottle in my local bottle shop that I’ve been speculatively eyeing off (it’s mine! Hands off!). Whereabouts do you live? Sad face that you have limited access to Japanese drops, cos they make some cracking stuff. Totally awesome that you can easily get hold of the Nikka FTB though. What the box look like on yours? The one that I’ve seen is just a fairly plain dark blue number.